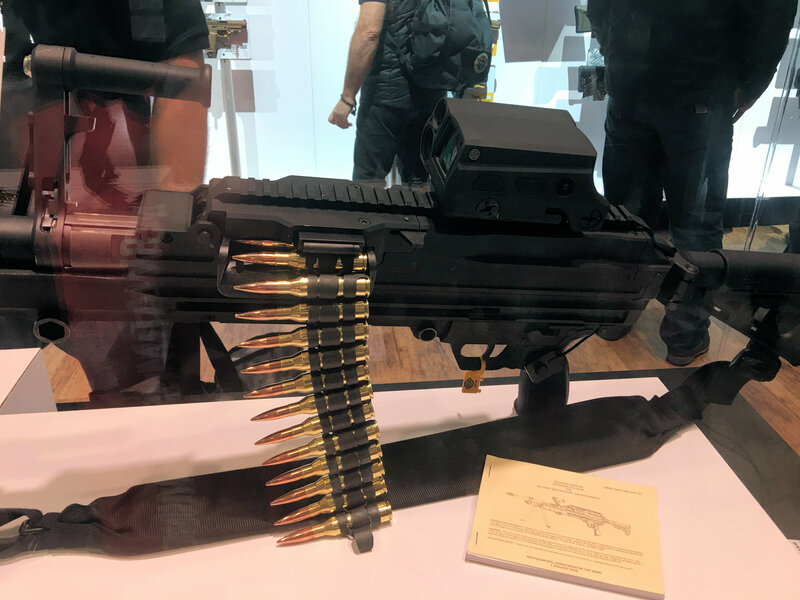 SIG SAUER SL MAG .338 Norma Magnum (NM) Lightweight Belt-Fed Machine Gun with Recoil Attenuation/Mitigation System and Lase-and-Engage Technology Electro-Optical Combat Optic/Laser Sight! (Video!) | DefenseReview.com (DR): An online tactical technology and military defense technology magazine with particular focus on the latest and greatest tactical firearms news (tactical gun news), tactical gear news and tactical shooting news. Alright, DefenseReview’s back. Sorry for the delay in getting fresh articles up, but DR’s been on travel, and doing some moving. 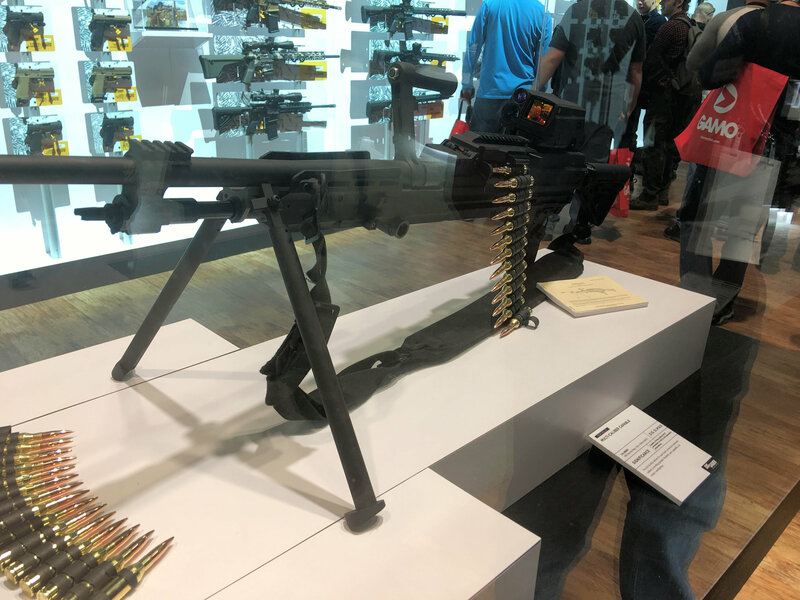 Now that we’re back, we’re devoting our first new piece to the SIG SAUER SL MAG .338 NM (Norma Magnum) lightweight belt-fed machine gun, since it’s definitely one of the most interesting and seemingly impressive new products we saw at SHOT Show 2019. And, assuming it can handle high round count full-auto without shooting itself apart, it’s going to be a winner. 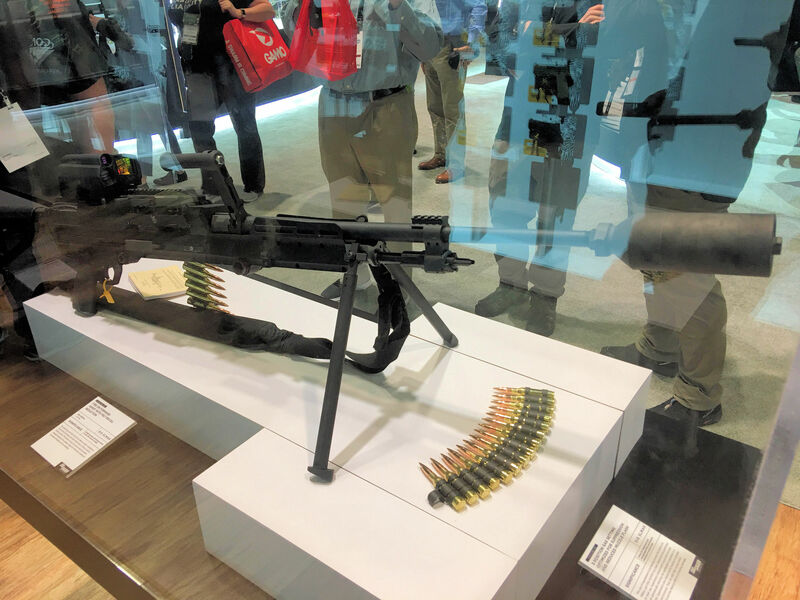 DR is of course curious as to how it compares to the General Dynamics GDATP .338 LWMMG (Lightweight Medium Machine Gun), which DR reviewed back in 2012 since the two guns will no doubt be competing directly against each other for military contracts around the world. 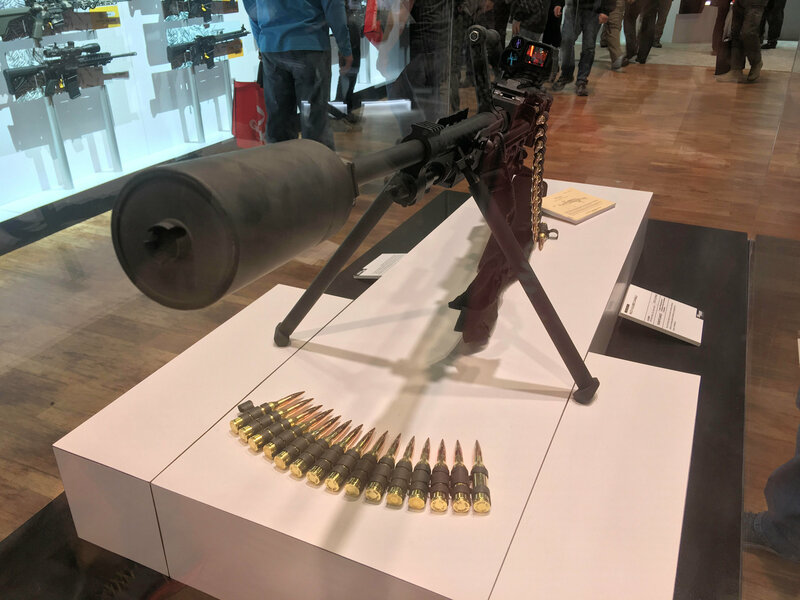 Editor’s Note: Your humble correspondent was probably one of the first civilians in the world to get to test fire the GDATP .338 LWMMG, and it was a pretty enjoyable experience. 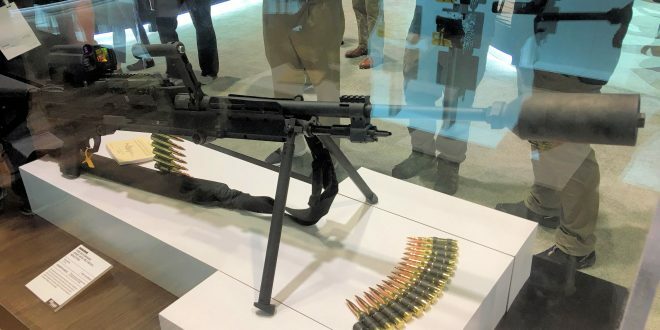 Unfortunately, we haven’t yet had a chance to do the same with the SiG SAUER SL MAG. 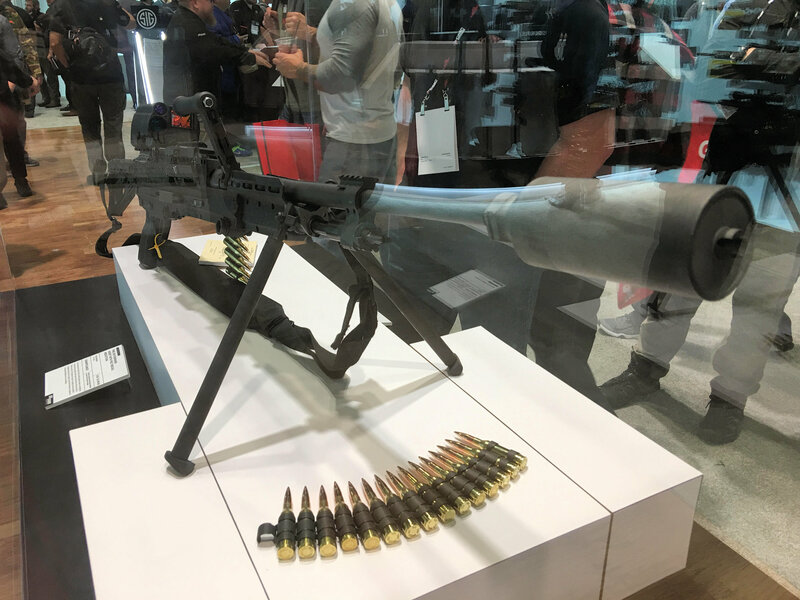 According to the SIG SAUER rep DR spoke with at SHOT, the SIG SAUER SL MAG .338 NM belt-fed machine gun apparently comes in at under 20 lbs, and is easy to shoot, thanks to its recoil attenuation/mitigation system. The SL MAG’s rate of fire (ROF) is applroximately 600 RPM (Rounds Per Minute). 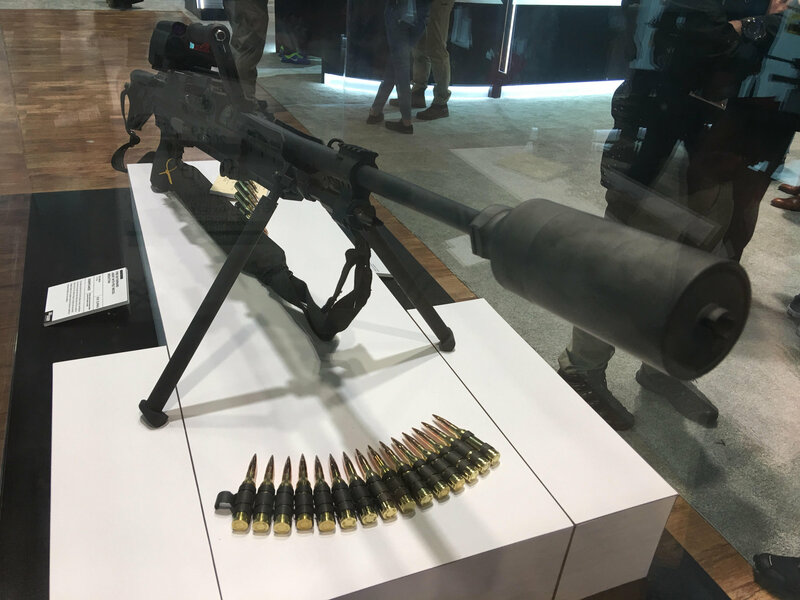 The gun’s also convertible by the operator (not just the armorer) to 7.62mm NATO (7.62x51mm NATO) within about 5 minutes. The SL MAG’s also optimized for suppressed fire, with three gas settings (Normal, Adverse, and Suppressed). The gun’s also fully ambidextrous with right and left-hand feed, and right and left-hand charging with quick conversion to either side. Pretty cool. The SIG SAUER SL MAG also has a quick-change barrel (QCB) system, and fixed headspace and timing. The SIG SAUER combat optic/laser sight shown in the photos and video is brand new. It sports a disturb reticle, ballistic calculator and laser, i.e., lase-and-engage technology for easy hits on (moving?) targets out to 1200 meters.